To allow us to complete our preparations for sailing – we have consciously uncoupled from formal homeschooling – at least for a few weeks. Our school board would forgive us. Our new environment – on a boat in Southern Florida – is providing ample opportunities for learning. 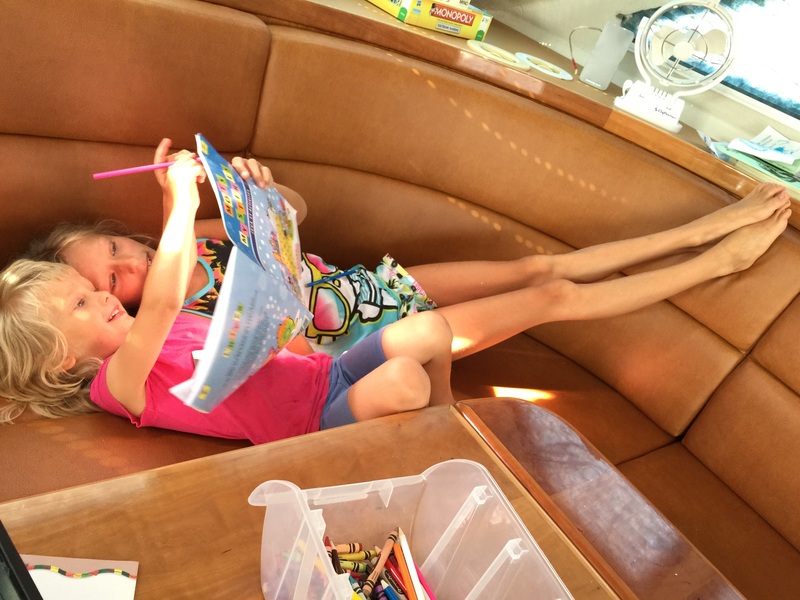 Karen (4) and Betty (9) enjoy a book on our catamaran, SV Aphrodite. If you have been following this blog, then you will know that we have just moved to a catamaran from Ottawa, Canada. We began homeschooling for the first time this past labour day weekend. But, in the interests of leaving the marina, my husband and I decided that we need to focus on loose ends. That means, we are organizing the boat, completing the work that remains, and shopping. In the short term, we’ve rented a car to buy spares, safety items, and food stocks that we might not be able to purchase again for some time. Our children are as happy as clams. Today, my husband and older kids ran some errands, while I stayed on the boat with our four-year old twins, Karen and Henry. Karen is keen to draw – almost all of her pictures are of fishy creatures like dolphins, and mermaids. Henry, prefers Lego. In the afternoon, I opened up a sail locker to retrieve some items that we plan to donate. In the process I opened up a world of possibilities for our twins. The video that follows captures their excitement exploring a new physical space. Whereas I sat last winter in front of a computer glazed and confused by terms like ‘forestay’, my kids are learning about sailing through direct exposure. For example, the saloon is where we eat breakfast. The cockpit is where we might retrieve a pair of shoes. And, the sail locker is at the front of the boat behind a door in the shower. In our short time in Florida, our kids have swam within feet of a dolphin, observed a family of manatees, and watched seabirds swoop and dive for fish. The local flora and fauna fascinates our children. For example, a short walk to the public library provides an opportunity to view cacti, palm trees, and an abundance of lizards. Seashells encircle the trees as we walk along the sidewalk. Shells seem to be a landscaping mainstay here, as opposed to the gravel we are used to seeing in Ottawa. At the local library, I was struck by the sea-creature puppets in the children’s section. They had a crab, shark, alligator and hermit crab. Libraries in Ottawa tend to have puppets of creatures that we’d be used to seeing on land. 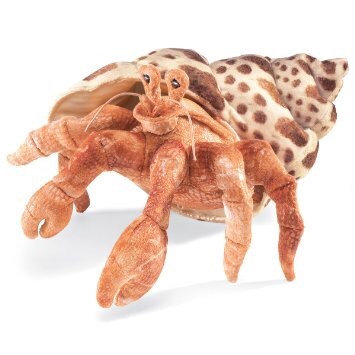 What’s not to love about the Folkmanis Hermit Crab Hand Puppet? Folkmanis Hermit Crab Hand Puppet, seen at our local public library in Southern Florida. Being on a boat means there are always a lot of things to do. To make this work for our family, our kids are learning about responsibility. The twins know that they have to help keep the floor clean. Paul and Betty have the task of washing the decks. Though, two siblings and a sprayer hose is not always a recipe for harmony. We want to be safe, clean and organized. The next week is crucial to getting us to where we want to be. We hope to run a tight ship. Later this month, we plan to depart to the Florida Keys, and hope to meet up with fellow blogger Miss Lone Star who hails from Texas. Their family is embarking on a similar journey to ours, and we will happen to be in the same area at the same time. While we’re in the Florida Keys we’ll be returning to the books and a more structured, curriculum-based school day. Next As Canadian as a catamaran? Good choice on the homeschooling hold. Your children are learning so much just as you are. When we started RVing 5 years ago I stressed about not being able to homeschool my kids”properly” in the early weeks. I soon let go and my kids learned so much without my planned curriculum. (Found your blog through Top Family Travel Blogs, an online daily newspaper we run that follows the blogs of traveling families). I just saw that you’re on a 50. We’re on a Gemini 34. You have so much more room than we do! It’s petty cool that you’re meeting up with Miss Lone Star. I follow their blog and it’s like seeing two friends meeting. Good luck when you resume school! I’m so happy you are all settling well. I also enjoyed seeing the book choice in the top picture of Betty. All the best on your continued adventures. I look forward to continuing to read the updates.